Tan Sri Hamad Kama Piah Che Othman pointing to the site of Warisan Merdeka development during the press conference pn Wednesday. KUALA LUMPUR: Permodalan Nasional Bhd (PNB) will be undertaking the Warisan Merdeka development over three phases in 10 years starting with the 100-storey tower next year. At a press conference yesterday to explain PNB’s plans for the project, president and group chief executive Tan Sri Hamad Kama Piah Che Othman said the development costing RM5bil would also have a shopping complex and condominiums. The 100-storey tower – touted to be the country’s tallest – will cost RM2.5bil to RM3bil and will have gross floor space of 3 million sq ft and 2.2 million sq ft of net floor space . “It will be a five-star green building. We are confident its completion in 2015 will create some excitement and spill-over benefits for the development as a whole,” Hamad added. PNB has set up wholly-owned unit PNB Merdeka Ventures Sdn Bhd to undertake the project. The company is headed by Tengku Abdul Aziz Tengku Mahmud who was from Guthrie Property Development Holding Bhd and Sime Darby Property Bhd. He came on board early this year. “We are now finalising the project design and concept, and may invite professionals, both local and foreign, to submit their ideas for the project. “PNB’s existing headquarters, Menara PNB will be 30 years old by the time the new tower is completed. We are looking for strategic positioning for the future and will need new office space for the expanding PNB group of companies. The Warisan Merdeka tower will become the new PNB headquarters while Menara PNB will be upgraded and leased out for recurring income,” Hamad added. He said the project was expected to yield reasonable returns of between 8% and 10%. PNB paid RM310mil or RM220 per sq ft to buy the 36-acre land from Pengurusan Danaharta Nasional Bhd in 2000. Hamad said the market value of the land was estimated at RM800 per sq ft today. Of the 36 acres, around 17 acres are occupied by Stadium Merdeka and Stadium Negara, which have been identified as a national heritage site. Conservation works have been undertaken to restore their heritage characteristics and the two stadiums are now being managed by the National Heritage Trust. The overall Warisan Merdeka development on 19 acres would have to complement and blend with the heritage theme, and together with the restored stadiums, the site was set to be another major landmark in Kuala Lumpur, he said. Hamad said although the project was scheduled to take 10 years, it may be expedited if market conditions warranted it. He said PNB had been expanding its portfolio of property assets from mainly investing in equities previously. It had been purchasing commercial properties that offered competitive returns and potential for capital appreciation at reasonable prices. Today, its property portfolio includes Menara PNB, PNB Darby Park, Kenanga International Building, Bangunan MAS in Kuala Lumpur, Hotel Perdana in Kota Baru and PNB Ilham Resort in Port Dickson. Its first offshore property, Santos Place in Brisbane, Australia, a six-star Green Star building, was acquired in August for A$287mil. Hamad said PNB was also active in property development through its strategic holdings in a number of companies, including the merged entity of Island & Peninsular Bhd, Petaling Garden Bhd and Pelangi Bhd. The tower forms part of Warisan Merdeka, which will be PNB's single biggest property project to date and its construction to create some 5,000 jobs. The 100-storey tower that forms part of Warisan Merdeka will be the new headquarters of Permodalan Nasional Bhd (PNB) as the fund manager is already thinking about redeveloping its existing head office. Come 2016, its main building on Jalan Tun Razak, Kuala Lumpur, will be 30 years old. It is already fully occupied by PNB and its companies. "We have to ensure we have occupancy. We need to move to this place. It will be mainly used by us and our investee companies," group chief executive officer Tan Sri Hamad Kama Piah Che Othman said at a briefing in Kuala Lumpur yesterday. Warisan Merdeka, a 10-year mixed-development project estimated to cost RM5 billion, will be PNB's single biggest property project to date. Its construction is set to create some 5,000 jobs. The tower alone, of about 525 metres, makes up half of the cost. The project will be done by PNB's wholly-owned PNB Merdeka Ventures Sdn Bhd, but it is open to having partners. It may also sell part of the 14.6ha site, but this has yet to be finalised as it also wants to have recurring income from the properties. "We must make sure returns prevail," Hamad Kama Piah said, adding that 8-10 per cent a year would be a good rate. More importantly, Warisan Merdeka will boost the prices of residential, office and retail properties in the Golden Triangle, especially the Jalan Hang Tuah area, Pudu and Imbi, said Zerin Properties founder and chief executive officer Previn Singhe. Property valuers said property prices shot up when the Petronas Twin Towers was built in 1985. Some foresee Warisan Merdeka to be the next KLCC. "We need to look at the project very objectively. New York had five tallest towers in the world at any one time and they are all doing well," Previn said. The land price in the Golden Triangle area is currently around RM2,000 per sq ft, while the net lettable area of a top office building is about RM800 per sq ft. But valuers who were not so bullish said the key challenge is how to deal with traffic flow. "You must look at the project site. It is very dense and road access and public transportation is limited. If the government can improve that, then we will have a different price outlook," said a valuer who declined to be named. This was acknowledged by Hamad Kama Piah, who stressed that PNB has consultants working on the traffic issue. The cost of improving infrastructure in the area has also been factored into the overall RM5 billion cost, he explained. SHAH ALAM: SP Setia Bhd's newly launched first integrated green commercial hub in Shah Alam, Setia City, will have a gross development value (GDV) of RM5 billion once completed within the next 10 to 15 years. President and Chief Executive Officer of SP Setia Bhd, Tan Sri Liew Kee Sin said the 240-acre integrated freehold mixed development, will set a new benchmark where green development is concerned within the Shah Alam skyline. "It will comprise office towers, hotels, service apartments and a retail mall with all the elements of the concept of live, learn, work and play," he said during the official launch of Setia City today. "With the confirmation of the building of three Grade A corporate headquarters for SP Setia, Top Glove Corporation and Khind Holdings Bhd, Setia City is now ready to be launched as the first integrated green commercial hub serving the Greater Klang Valley," he added. He also indicated there are also plans to bring in private universities. According to Liew, the commercial hub will be one of the largest master-planned city centres in the Klang Valley and carry the SP Setia stamp of lush tropical landscapes featuring parks and gardens, as well as lakes and waterways. "Setia City will also be the first integrated project to have all the buildings certified under the Green Building Index," he highlighted. Setia City, he said, has managed to attract international and renowned property player, Lend Lease, headquartered in Australia to jointly invest in the development of a retail centre to be known as Setia City Mall. "The new mall will form the focal point of Setia City. "The confidence the market has in Setia City Mall has led to the signing of major anchor retailer, Parkson, as well as leading cinema operator Golden Screen Cinemas. "In addition numerous other specialty retailers have been secured," Liew said. When complete, the mall he said, will offer a fun and affordable family experience comprising amazing green space, fantastic shops, great food and entertainment. SHAH ALAM: There is still a long way to reach property bubble in Malaysia, says Housing and Local Government Minister Datuk Wira Chor Chee Heung. According to the Housing Index for the last 10 years, prices of houses have moved about 37 per cent while in countries like Singapore and Hong Kong, property prices shot passed 35 per cent last year, he said. He said property prices in Malaysia started to rise since 2008 due to land cost, building materials and vibrancy of the economy as a result of the initiatives and measures taken by the federal government. "This is also as a result of foreign companies coming into this country to invest in properties. Because of the aggressive policies by the government, a lot of foreign companies set up bases in this country and bought properties for their senior staff and executives," he said when launching Setia City, an integrated green commercial hub in Shah Alam to be developed by SP Setia Bhd. Chor, however, said it did not mean ordinary people who just joined the workforce are not able to buy houses. "If you go further up a bit, 10km away from the KL City Centre, you are still able to find a reasonably-priced house. "If you say you can't find houses in the Klang Valley within the RM350,000 range, I will not believe you, but you have to travel a bit further out of the city centre. "In central Kuala Lumpur, you can't find houses within the range of RM150,000 to RM300,000. Last year and this year, the most sought-after properties are in the range of RM150,000 to RM180,000. "In central Kuala Lumpur, you can't find houses within the range of RM150,000 to RM300,000. "This is the result of government efforts to transform Kuala Lumpur into a bustling city. 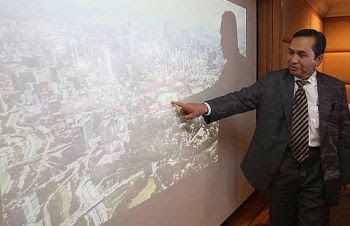 If you find a house at RM200,000 within the Kuala Lumpur City, this means our economy is in bad shape," he said. Chor said the government was concerned of this and that was why incentives were provided for in the 2011 Budget to assist low-income earners and young people who just joined the workforce to buy houses. The minister, however, said the government would not control property prices as Malaysia was a free economy. "The government will intervene if certain things happen that will bring disaster to the economy and the people," he said. Chor said people have been buying houses since 2008 and he did not deny that there could be some speculation. "There is also a sudden drop in the number of houses to be built last year and this showed developers are also studying the market situation," he said. SP Setia president and chief executive officer Tan Sri Liew Kee Sin said there was no where to build houses within the RM350,000 price range except in Johor where land was cheaper. "Land cost is a factor of the end-product," he said, adding that a large portion of SP Setia's projects were within the price range of RM400,000 to RM1 million. KUALA LUMPUR: Permodalan Nasional Bhd (PNB) is planning to upgrade Bangunan MAS into a Grade A++ office building and a new five-star hotel apartment block will be added on the site, said president and group chief executive Tan Sri Hamad Kama Piah Che Othman yesterday. PNB bought the 35-storey building on Jalan Sultan Ismail from Malaysia Airlines (MAS) three years ago for RM130mil. Hamad said the former MAS headquarters would be refurbished and leased out for recurrent income. It is believed the hotel will have world-class standards and will be operated by a professional hotel group.